Fill out our simple form and get quotes from local fun foods suppliers. 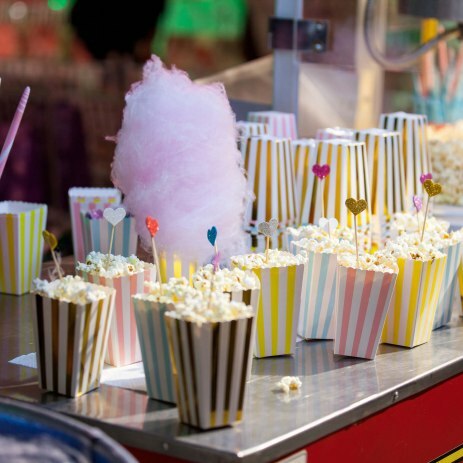 From hot dog stands, popcorn stalls and candy floss machines, to slush puppy vendors, and chocolate fountains, any of these fun foods stands will be the talk of the town at your next event. These are fun for both adults and kids alike and really add something to an event. We have a great selection of fun foods available: Popcorn, candy floss, hot dog warmer and slush. All can be supplied with operators and all consumables for a hassle free experience. Whether you would like candy floss, toffee apples, toasted marshmallows we have a cart for you. Perfect for your small or large event. We offer fun, laid back, hassle-free & stress-free wood fired pizza, sides, salads & desserts. Great for parties and informal/fun occasion catering. Alice in Wonderland high tea to Pink Party, we are experienced to ensure that the food for your event will be in keeping with the theme. With so many fun foods to choose from you’ll find it hard to make your choice! Beside offering your guests a tasty treat and a novelty snack, these fun foods bring something to each event that will entertain as well. You and your guests can watch the kernels popping away and enjoy the smell that comes with it too, watch the floss being spun onto sticks ready to eat or savour the pick and mix stand waiting to be demolished, full of childhood favourites. There are a wide range of fun foods to choose from here so take a look and see what will work for your event.